I won’t duplicate what Natasha the Robot posted about @Testable in Swift 2. It’s short and sweet. Check it out. This morning I ran into yet another example of where tests can help you catch simple mistakes. I’m working on creating a custom control that simulates an automotive style fuel gauge. This involves rotating a needle layer to indicate the fuel level. 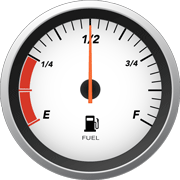 However, I don’t want to needle to rotate across the bottom 1/4th of the circle (over the gas pump icons), only across the top 3/4ths. This became a problem when I added animations. UIView.animateWithDuration always takes the shortest distance. So animating the needle from pointing to empty to having it point to full would result in the needle moving counter-clockwise across the bottom of the gauge. A real gauge would never do that. Unfortunately, angles are expressed in radians, not degrees, and that’s where I made the mistake. My quick, mental conversion of degrees-to-radians was wrong; 180 degrees equals pi, not pi/2. This mistake didn’t cause the code to fail, it just didn’t work as desired (using 2-part animations for all angles greater than 90 degrees instead of 180). Beware of mental math; for example, converting degrees to radians in my head in this case. I was lucky, and the 2nd time got it right, so my tests exposed the problem. However, I could very easily have made the exact same mistake in my tests. Where possible, use explicit calculations in your tests (if not also in your code). In this example, I created a convertDegreesToRadians() method in my tests. Had there been a similar function available in math.h, I would have used it. Note: I will be releasing this code to GitHub shortly. It will include all of the code for a framework containing a set of animated, automotive style gauges including Fuel gauge, Speedometer, and Tachometer. I’ll update this post with a link once it is available. This looks pretty simple, right? For those of us still learning Swift, it isn’t simple. What happens is that the compiler refuses to build, with the error: ‘MyProtocol’ is not identical to ‘AnyObject’. Now all the other code works. I’ve been working with a Swift project, and recently decided to add MMWormhole to it. This is the first Objective-C code to be added to this project, so I needed to review the Apple WWDC 2014 videos and developer documentation to figure out how to that. It appears at first glance that the process is very simple. At least, it should be. 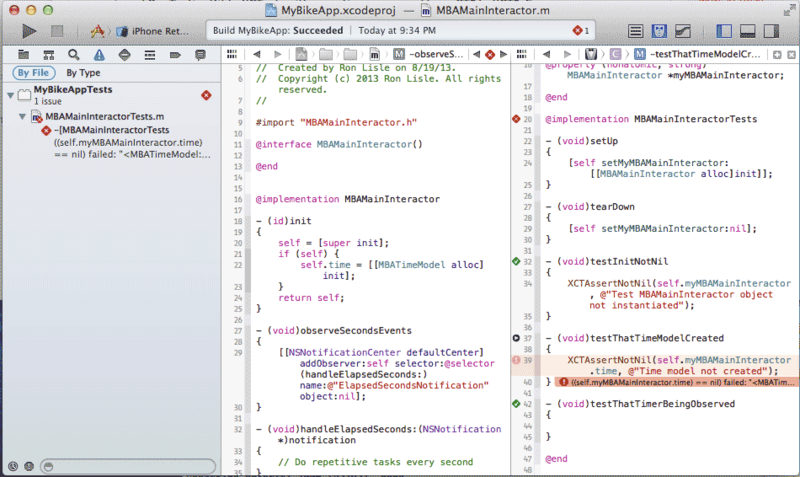 What I ran into though appears to be bugs in Xcode. The first bug I ran into was a problem with the prompt to automatically create the bridging header. When an Objective-C file is added to an all-Swift project, Xcode is supposed to ask you if you’d like a bridging header to be created, and then do so. This didn’t happen, but it’s no big deal. The bridging header can be easily created manually. This is pretty simple, but may not work depending on whether you hit the second bug I ran into, described further on. Repeat step 2 for the test target if you’re going to do any testing that needs to reference the Objective-C code also. This shouldn’t be necessary in most cases, but I needed to do so in order to write a unit test to try to catch the second bug. The second bug is much worse. It appears that once a project starts getting bigger or more complex, the bridging header just stops working. By that I mean that the objects included using the bridging header (MMWormhole in my case) stop being found, even if previously building ok.
I’m in the process of recreating my project to try to determine exactly what steps cause the bridging header to stop working. I’ll update this post once I’ve found it. A friend of mine ran into an issue when trying to test a Swift class that had been added to his otherwise Objective-C project. Since he already had a good suite of Objective-C tests, he simply wanted to add an Objective-C test. This caused various compile errors. The solution was to add the Swift file to the test target. By default, tests are run as “application tests”. This means that the tests are injected into the application. Hence tests have access to everything in the application. However, Swift files are compiled into a separate module during the build process, and thus not visible to the test target. You can think of this as meaning that Swift files are in effect run as “library tests”, and thus must be added to the test target to be visible. I’ve become a fan of creating one’s own test doubles (aka mock objects) instead of using a mock framework like OCMock or OCMockito. Uncle Bob describes this process in one of his Clean Code videos, and it seems to work very well in Swift. Why create your own mock objects? There are a couple reasons for doing this. Tests can be more readable. I say “can” because its really up to you to create readable mocks. You have nearly unlimited faking capability. I say “nearly” because there are some things that may not be possible using class inheritance, for example overriding methods or properties that have been marked as “final“. So let’s take a look at using manually created fake doubles for testing a simple Power class. This class has one purpose: to report whether or not the device is plugged-in. The way this is done on an iOS device is by using the batteryState property of the UIDevice currentDevice singleton. Uh-oh, did I just say “singleton”? Yep. That’s typically bad news for unit testing. However, this won’t be a problem for us because we’re going to replace the UIDevice singleton with our own fake object. This means that we’ll have to follow the “tell, don’t ask” principle, and pass in the UIDevice object to our Power object instead of letting it “ask” for the singleton UIDevice currentDevice object. So here’s a question for you. In which file do we put the mockPluggedInDevice code? I’m a bit conflicted on this. On one hand, I usually prefer to keep test code completely out of product code files. But on the other hand, mock objects are by nature going to be pretty dependent on the product code they are mocking, so I should probably keep it with the product code. Clarification: For simplicity, I am using the term “mock” object to describe what would more accurately be called a “stub”. Martin Fowler clearly defines the difference in this 2007 article. Awhile back I blogged about how to test storyboards by loading the ViewController from a Storyboard. Recently I’ve been trying to figure out how to do the same thing in Swift. Update: latest code appears to be working ok for testing view controllers as long as I don’t try to run them on an actual iPhone device. When I do that, the test hangs. The code and instructions posted by Mike Cole appear to almost work in Swift with the latest Xcode (I’m using Xcode 6.2, but 6.1 works also). I had to also reference the ViewController’s view. Evidently the ViewController will lazy load the view, meaning that the outlets don’t become connected until after ViewController.view is referenced. Also, be careful what you put into your view controller’s viewDidLoad method. Code that requires that the view is actually being displayed should be moved to viewWillDisplay or may cause the unit test to crash (since there isn’t really a display during unit testing). Example XCTest setup code to load a viewcontroller named “MainVC” from main.storyboard. I’ve left the previous post below, but it’s basically outdated now. After running into various problems, I resorted to using Objective-C unit tests, and describe how to do so below. I wouldn’t recommend doing so anymore, since Swift tests appear to work ok now. After fumbling around for awhile with the Swift test case file, and not making much progress, I decided to try something different, and tried adding an Objective-C test case file to my Swift project. At least in this case, I know how to load the ViewController from the Storyboard. And this actually worked. This turned out to be fairly simple. Let me warn you though, that I consider this approach to be a temporary hack, albeit an interesting one. I believe the correct solution will be to figure out how to do this in a Swift unit test case file. At this point though, I’m not sure if I’m being prevented from doing so due to bugs in beta level Xcode 6, or just my lack of Swift knowledge. Set the product module name so that you will know the swift header file name to import (eg. “#import ProductModuleName-swift.h”). Note that this should not be necessary, as the Product Module Name is supposed to default to the Product Name. This wasn’t working as of Beta 2. Add an Objective-C unit test case file. Make sure to set the language to Objective-C. It will default to Swift. I did not have to create an Objective-C Bridging Header for the Swift ViewController, because I’m only going the other way, from Swift to Objective-C, but I did anyways when prompted. I don’t think having it will hurt anything, and you might want it later. That was it. This then gave me access to my ViewController definitions. Then use the previous described method of loading a storyboard and viewcontroller from it. I will update this article once I figure out how to do it correctly in a Swift unit test case file. The iOS folks around here are all abuzz about the new Swift language announced by Apple this week. Surprisingly, this information was released publicly, so no NDA required to talk about it. You can find the information at https://developer.apple.com/swift. While there are still a lot of questions about the implications of testing in Swift, at first glance it looks pretty straight forward. One nice surprise, reported yesterday on BendyWorks.com, is that Setup() isn’t needed to create fresh instances of the object-under-test. Simply creating a as a constant stored property of the test case class results in a fresh instance being created for each test. I’ve run through some TDD katas using Swift, and after some initial adjustment to the new language, I have to say that things appear to work fairly well. I’m really warming up to Swift.